Using jigs can make a repetitive task much easier by allowing you to precisely make the same cut over and over with your tools. A lot of jigs are made with wood because it’s cheap and there is often a lot of scrap lying around your shop. Wobble Wedges® offer a great solution when you want to make a jig that you can adjust, and they can be used to make modifications to existing jigs that you already have. Finishing a desk or table that has beautiful curves with a bevel can be tricky, especially if you don’t want the bevel to be at a 90 degree angle. This jig from Fine Woodworking is specifically set up for adding an angled bevel to an irregularly shaped piece of wood. Instead of making your own wedges for this jig, we suggest using Wobble Wedges®. The BigGap™ wedge has a 7.13º angle and can be secured with screws to the bottom of an auxiliary base. For a slightly smaller angle use a Standard wedge by itself for an angle of 6.45º. If you wanted a larger angle you could stack a Standard and BigGap™ together to get 13.58º angle. You can stack our wedges safely because of their patented interlocking ridges. Use the pre-drilled screw holes in the Wobble Wedges® to secure them in place and now you can cut that angled bevel! If you want to cut the same length over and over again on a mitre saw, one of the easiest ways to do this is with a stop block. To make a stop block with Wobble Wedges® take 4 BigGap™ Wobble Wedges® and stack them so that they form a rectangle. Use 3 hard plastic wedges and a soft/flexible BigGap™ wedge on the end of the stack that will be against the fence. The soft/flexible ridges on the bottom wedge will grip the metal of the fence and keep it in place. Clamp the stacked wedges to the fence, voila! A stop block that will keep your cuts even! If you’ve taken the time to make a jig for a project, you will likely be holding on to it for future needs. But what if you are doing another project that might be similar but not exactly the same? Being able to make slight adjustments to your jigs can be helpful, that’s why Wobble Wedges® make a great addition to any handyman’s tools. Make fine-tuned adjustments to existing jigs with Mini Wobble Wedges®, their measurements are 1.12″ x .58″ x .16″ (LxWxH). 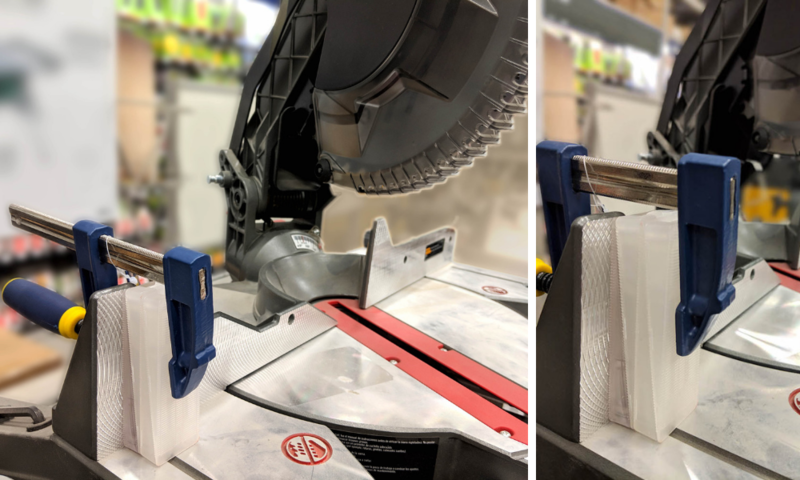 Just like all Wobble Wedges® they can be cut to size and have a pre-drilled hole so that you can place them and then adjust them without issue. Our Standard Wobble Wedges® are 1.92″ x 1.11″ x .25″(LxWxH) and our BigGap™ are 3.52″ x 1.13″ x .48″(LxWxH). All three wedges come in both a hard plastic (that can take +2,000lbs of force) and a soft/flexible plastic that is bendable and easily cut to fit any space.